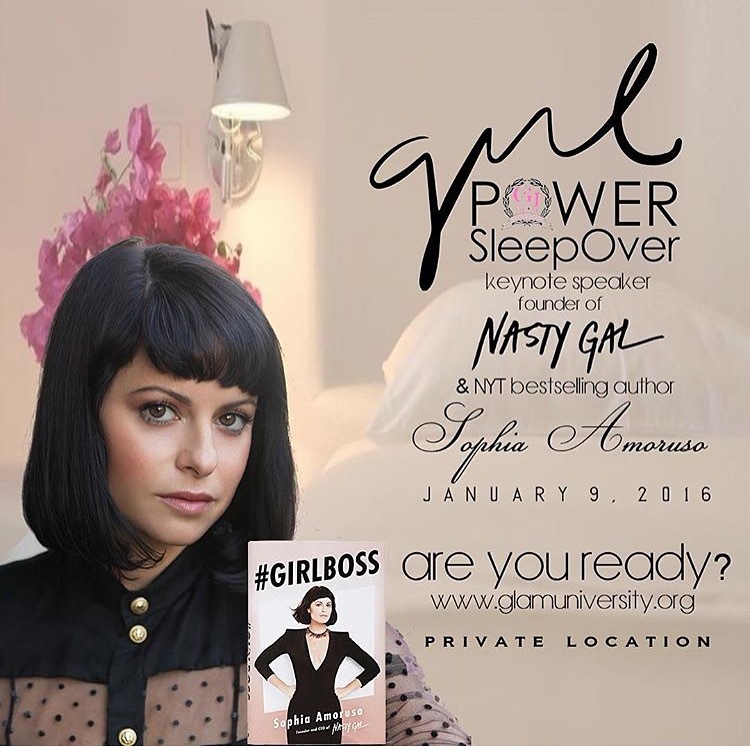 Atlanta, GA. 7 December 2015 – It’s almost time for the biggest female entrepreneur event, the Girl Power Sleepover on January 9th in Atlanta featuring key note speakers, Sabrina Peterson of GlamUniversity and Sophia Amoruso of Nasty Gal. This 2-day event is an overnight business boot camp held at the swank W Hotel, focused on educating and empowering women in a more relatable way. GlamUniversity will gather 300-500 women from all over the world to network, share ideas, and learn from not only each other but 25 successful female business owners. Attendees will have the opportunity to participate in a 4hr intensive class on the art of running a small business in a large business mind frame alongside of several hands-on business and marketing workshops. Ladies who join the Girl Power Sleepover will also have the option of one on one business consultations with Sabrina Peterson and the 25 key note speakers, as well as one month of post event coaching and a monthly girl power conference call. Guests will indulge in cocktails, food, and fun all while experiencing bonding with other like-minded females. “It is my mission to show the world that women can lift each other up, and we too can be powerful. The sleepover is just the start of how we are going to paint every city pink, spreading girl power,” Glam University CEO Sabrina Peterson states. Want to join us at the Girl Power Sleepover? Sabrina Peterson is a personal developmental mentor, entrepreneur and owner of a wildly successful beauty salon – The GlamBar. With a natural ability to coach individuals to their highest potential, she created GlamUniversity, a business boot camp. GlamUniversity has coached numerous entrepreneurs into creating a successful brand and business by thinking outside of the box. Sabrina creates a platform for aspiring and successful entrepreneurs to merge, promote their brands and grow. In addition to coaching entrepreneurs, Sabrina has also began her path as a motivational speaker for businesses through Glam Takeover, which is geared towards increasing sales and clientele.